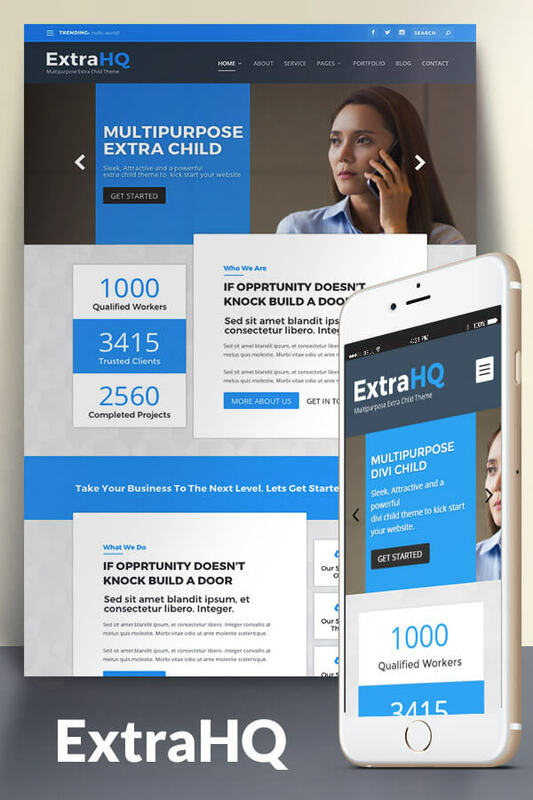 ExtraHQ is a multipurpose extra child theme. It’s bundled with professional designed layouts to get you started almost any type of website quickly. It’s Lightweight & 100% Visual Builder compatible. It also adds a new powerful feature to set layout’s colors scheme to truly unlimited colors scheme. ExtraQ includes custom designed page layouts for every page you see in the demo site. You can easily install page layouts and add and remove sections with just one click, using a simple drag and drop interface. Upon purchasing this template, you will receive a zip file containing the child theme files which you can upload to the themes section same as you install any theme and activate it. Upon activating you will be redirected to a welcome page in the backend which contains some instructions and details to help you setup your website. Please be aware that you will need an amount of experience in EXTRA Theme and WordPress to take advantage of our themes and plugins. Please make your decision to purchase based upon your skill level to see if our products fit your needs. Due to the nature of Digital Downloads. Refunds are completely at our discretion. Important: The images used in demo will be imported too but for demo purposes only, please consider using your own images.